So I began the journey of crafting out a different way to look at chords, a way that is quite exciting and perhaps really great to work with if you’re just beginning, love guitar and looking ahead to see how much you can learn. 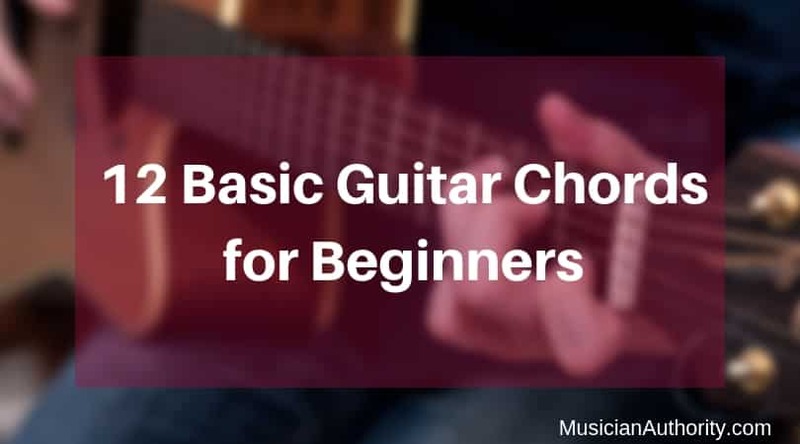 This is a start to that journey, as I will talk about the 12 Most Basic Guitar Chords for Beginners. What are chords? Simply, they are taking 3 notes and playing them together or quite closely together. They make up the backbone of many songs. You get different types of chords – major, minor, seventh, augmented, diminished etc. Well, I guess I’ve lost you after that list, but don’t worry we’ll get to a few of these names in a moment. When we remember names it’s just like meeting someone new, sometimes they have a name that is easy to pronounce, sometimes it’s unusual and sometimes you just plain forget their name; only seconds after they have just told you. Yet, you probably continue with the conversation to find out what they do, where they live or any other information that you’re interested in about them. Chances are that the next time you meet them, you might remember their name, but more importantly you will remember something they said or what they look like. Depending on the way your amazing brain works, we remember certain things differently. So let’s play ahead and learn the building blocks to some basic chords. Remember not to worry about memorizing everything, but get used to how the chord feels when the sound waves touch your fingers or the way your hand is positioned on the guitar. As all of us enjoy having fun and we like things that generally make us happy; let’s start with the Major Chords. Major Chords remind us of sunshine and good times. Hopefully the MAJORity of your time is full of excitement and fun! There are 5 Major chords I think are key to learning first. They are A, D, C, G and E major. Let’s introduce you to A major. That’s the name of the chord. It’s the same as saying my name is Kelsey Rogers and my brother’s name is Jess Rogers. We belong to the same family but we have different names. Music is life and so we can draw many parallels to life within music. So let’s get to our major chords. A major belongs to the family of Major chords and it’s the first letter of the alphabet. To play this chord, place your three fingers in a row on the second fret of your guitar. The index finger is on the D string, middle finger on the G string and ring finger on the B string and Voila! You are playing the A major chord. Have a look at its shape – reminds me of a caterpillar crawling sideways on the middle of my guitar. Congrats, this is the first chord complete. Let’s meet the rest of the family. D major is next. He’s in the same family and looks a little bit like his sister A major. So the index finger and middle finger stay on the second fret, but they move. The index finger moves to the G string and the middle to the highest E string. Then we move the ring finger to the B string, 3rd fret. Have a look and listen to the sound of this chord. It might elicit some type of feeling. The very next chord in the family is C major. It’s often been dubbed: “the people’s chord.” It’s one of the most prevalent chords in our music history. It appears almost everywhere and you probably hear it every day on the radio. This chord requires you to stretch your fingers a little more as each finger gets placed on one fret. Even though your index finger is now beneath your other 2 fingers, be sure to put your ring finger down first. So if I had to ask you to play C major, the best thing would be to see you put your ring finger than place your middle finger and thereafter your index finger. It seems counterintuitive, but trust me it will help you. Why? If you are strumming you normally play the guitar by touching the strings from lowest to highest and your hand goes in a downward motion. That means we are going to first hear those lower notes and in the C major chord, those notes are played by your ring finger first. Then we move on to G major and E major. These look a little more like D but with a stretch. It has more of a tower shape as the middle finger is above the others. And there we have it! The first members of the major family. A lovely article on the major chords can be found here: https://www.uberchord.com/blog/learn-guitar-chords/ and it’s by the company who designed the app, Uberchord, which is definitely something to check out on your journey. The next family is the minor chords. They are generally quite forlorn and a bit sad, however when mixed with other things these chords can add spice and flavor to even our happier times. I guess that this is the same principle that surprises us in our lives. As beginning guitarists we should learn to play these next 5 chords. They are A, D, C, G and E minor. We often see them written as: Am, Dm, Cm, Gm and Em. If you see that small letter “m”, written next to the chord that means it is in the minor family. If there’s no “m” or a capital letter “M” e.g. AM, then we can assume it is A major. I’ve found the best way to get these major and minor chord flowing and transitioning smoothly is to mix them up and play them in different orders. Try playing the chord then counting to 4, and then the next time you count 1, change to a new chord. This will get your fingers moving fast and will get you into the zone. After all, songs use these chords in so many different patterns. You can now successfully go out and play so many tunes with just these chords. A great resource I use often is Ultimate Guitar. It’s great for quickly finding chords and to get going on playing a tune: https://www.ultimate-guitar.com/. Lastly, to add some feeling of need and urgency we will add two seventh chords to our list. Seventh chords, when played next to other chords, make us feel the most amount of anticipation to get to another chord. I would suggest adding A7 and E7 to your mix. They are only played using 2 fingers and so are slightly easier than the previous chords discussed. This is a great start and definitely these chords would have whet your appetite to learn more. I love this opening statement from Rick Peckham; who, if you are looking for more, I recommend taking a look at the following Berklee course. The above definitely elaborates on why it seemed so difficult to count how many chords there are, because we can expand and manipulate the chords in so many fascinating ways, that yes – the options are endless. However, don’t let that stop you, but add to the intrigue of music as you can see that just after learning these chords, you can enjoy and play thousands of songs. Enjoy the experience!